Here’s the press release announcing the American Idol 12 Top 10 finalists. Also: The theme next week will be “Music of the American Idols.” The finalists can pick a song sung by a winner on the show, or in a winner’s post Idol career. Plus, the Idol’s first group number will be Owl City’s “Shine Your Way,” from the soundtrack of the upcoming Animation comedy, “The Croods.” Synergy! Plus, Bon Jovi and Phillip Phillips will perform on Thursday’s results show. Tonight in the first LIVE results show of the season from Los Angeles, AMERICAN IDOL revealed the Top 10 finalists, including Lazaro Arbos, Janelle Arthur, Curtis Finch, Jr., Candice Glover, Kree Harrison, Amber Holcomb, Paul Jolley, Angie Miller, Burnell Taylor and Devin Velez. In addition, host Ryan Seacrest announced an exciting new opportunity for fans to choose an 11th Idol to go on the “American Idol Live!” tour this summer, brought to you by AT&T. Next week, AMERICAN IDOL will hold a sing-off between the sixth-place runner-up girl and guy for that coveted spot. This season, AT&T is giving the audience brand-new ways to be involved with the show. Next week, Wednesday, March 13 (8:00-10:00 PM ET live/PT tape-delayed), the Top 10 finalists will perform “Music of the AMERICAN IDOLs,” which includes songs performed by any past IDOL winner. Tune in the following night, Thursday, March 14 (8:00-9:00 PM ET live/PT tape-delayed), as America finds out who received enough votes to continue in the competition and who will be sent home. In addition, world-renowned rock group Bon Jovi will perform their lead single “Because We Can” and quadruple-platinum, Billboard chart-topper and AMERICAN IDOL winner Phillip Phillips will perform “Gone, Gone, Gone,” the second single from his debut album. “Gone, Gone, Gone” also will serve as the “goodbye” song of the season and will be featured when the IDOL finalists are eliminated each week. The finalists will also perform their first group number, “Shine Your Way,” from the motion picture soundtrack for the upcoming DreamWorks Animation comedy, “The Croods.” The original track is performed by multi-platinum recording artist Owl City and artist Yuna. In addition to online voting, fans will continue to be able to vote during the voting window via toll-free phone lines, as well as text-messaging for AT&T wireless customers (standard text-messaging rates may apply). At the end of each performance show, the phone lines will open for at least two hours and AMERICAN IDOL viewers will be able to vote for their favorite contestant(s) via the toll-free telephone numbers (1-866-IDOLS-01, -02, etc.). AT&T wireless customers can use their cell phones to vote by texting the word “VOTE” to the four-digit short code (5701, 5702, etc.) that corresponds with the contestant of their choice. AMERICAN IDOL voting is managed by Telescope, Inc.
“Like” AMERICAN IDOL on Facebook at www.facebook.com/AmericanIdol. Follow the series on Twitter @AmericanIdol and join the discussion at #idol. Also, follow host Ryan Seacrest at @RyanSeacrest, and follow the judges: @MariahCarey; @yo_randyjackson; @nickiminaj; and @keithurban. 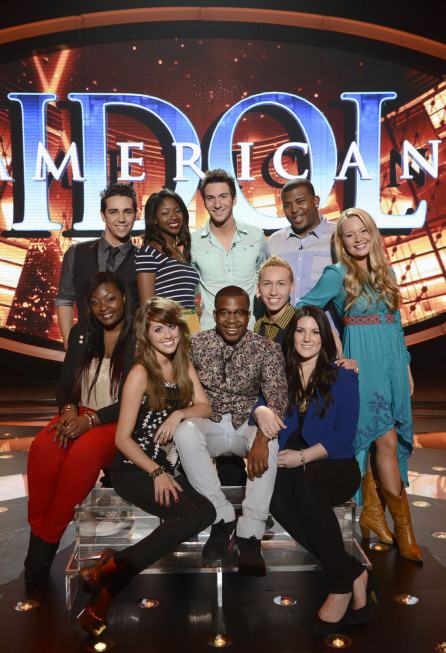 Download the AMERICAN IDOL app for iOS devices from the App StoreSM; and for Android devices at Google PlayTM Store. ** Data rates may apply for app download and usage.